Property research is a popular reason for visiting us at PAMA’s archives. People come here to investigate when their house was built, who once owned pieces of land, or whether a property is worth designating as historically significant. 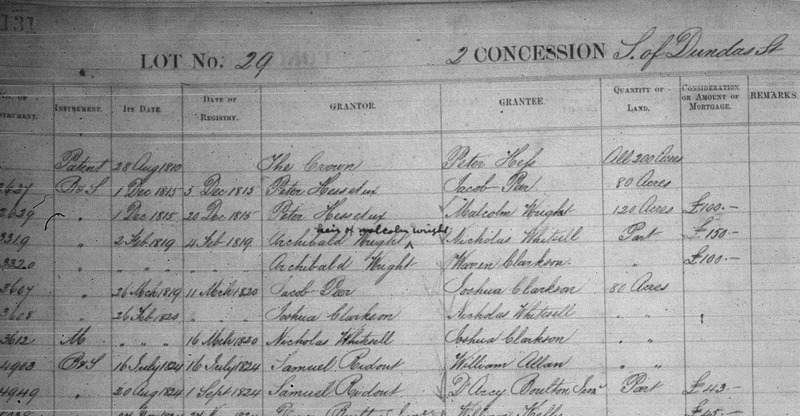 This post will give you an overview of doing archival property research within Peel. Depending on why you’re researching a property, your needs may vary. In future posts we’ll get into more detail about how to use some important land records. For now let’s look at some basic guidelines and record types. Be prepared to do some detective work. Unless the property you’re researching has an unusual history or heritage designation, there likely isn’t a file of information on it. You’ll be doing original research trying to locate your property in historical records: you’ll be following clues to put together the pieces of a puzzle. Some clues may lead you dead ends. Others may lead you to treasure you didn’t expect. bank on spending several hours on your investigation. document your evidence by taking notes. consider bringing a camera and a USB flash drive! Dig out (and bring) the legal description of the property. Did you know that most Peel properties have two addresses? The ordinary street address is used for mail and street maps. But properties also have a legal description which is how the government views the property for tax and legal purposes. Unlike street addresses, legal descriptions are packed with information that ties the property to its location and history. In order to help you best, we need your legal description. Here are a couple of examples of legal descriptions. Know what you can and can’t find in the archives. No archives collects everything. For one thing, since we collect unique records, we tend to specialize. Also keep in mind that we can only provide access to records that survive or were given to us. Some simply weren’t. Except in rare cases we won’t be able to help you with researching non-Peel properties, or with obtaining building plans or private surveys. Also, for information about recent (ranging from the 1960s till the present) property ownership you’ll need to visit the Land Registry Office. The key in knowing what records to search is to think about why or when your house or property would have been captured in a record. The answer is usually whenever the property changed ownership or was officially assessed in some way. Here’s a shortlist of the types of historical records you’ll typically be working with in your property research. Beyond these (and depending on the property) we can also use other records like photographs, personal manuscripts, newspapers, and directories. The abstract indexes summarize the registered transactions by which lots in Ontario were transferred from one owner to another. These lists begin in the early 1800s with the patent of land from the Crown to its first owner. Your legal description will help us to figure out which index you should be looking at. The index only tells you who owned land, how much they owned, how much they paid to buy or mortgage it, or whether they inherited or were given it. It usually won’t tell you about buildings on the land. However, a sudden increase in the value of the land can signal something was built on it. Also, the index can point us to wills that may mention structures. The associated copybooks give us the text of the legal transactions summarized in the indexes. They can contain transcriptions of wills which sometimes describe buildings. 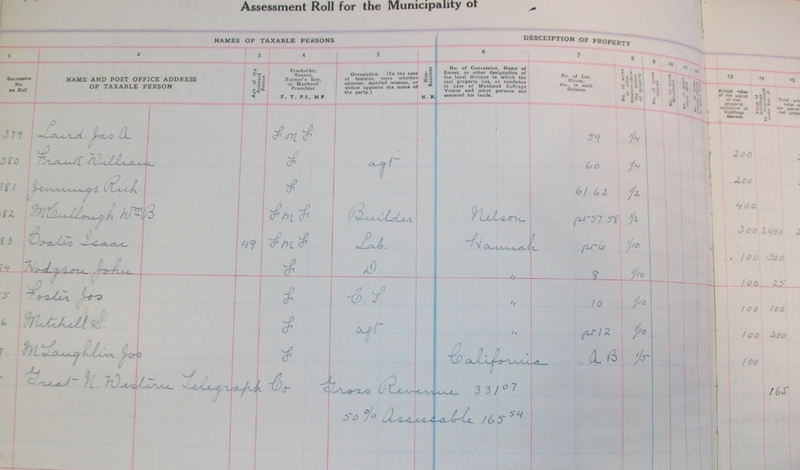 Assessment rolls are ledgers kept by townships, municipalities, or villages that show how much tax was owed on a township or subdivision lot and the buildings on it. Sometimes you can learn more about both owners and buildings from these rolls. Details can (but don’t always) include occupants’ names, ages, and occupations, as well as the location and value of their land and buildings. Tax assessors walked up and down the street as they collected and recorded this information. Depending on their routes, sometimes a lot of patience is needed when searching their records! The 1859 Tremaine Map of Peel shows the farms of the time. The Historical Atlas of Peel County gives us a snapshot of who owned lots in 1877 and shows locations of farms, houses, schools, churches, and post offices. 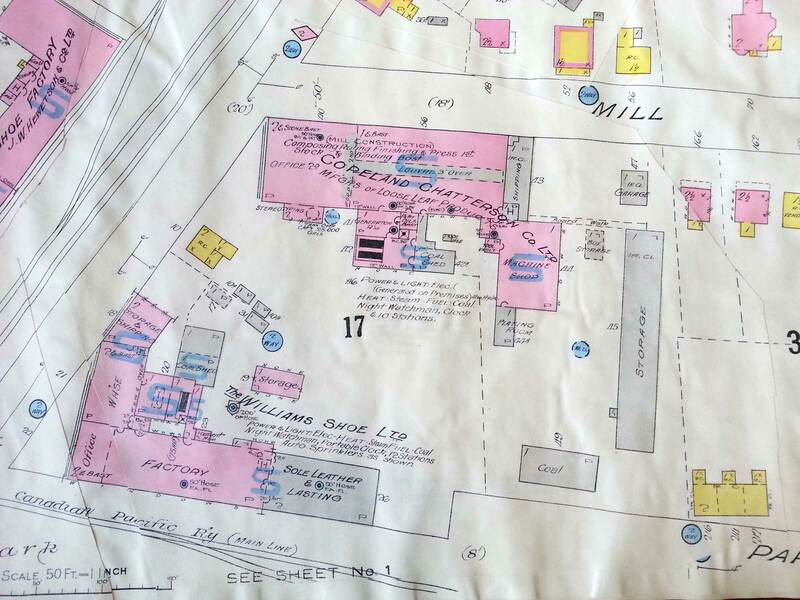 Fire insurance maps show the footprints and building materials of structures in built-up areas for selected years (only a few towns or villages commissioned these). Registered plans show us the intentions of subdivision developers. Property research can be an exercise in patience; it can also open an intriguing window on how past Peel residents used and related to the land. Watch for future posts giving you an even closer look at some of these records. Posted by Samantha Thompson, archivist. This is the first post in our category “Archives How-to’s” where we provide you with information and guidance on how to research our records.